Shibuya City Office／Shibuya Community Bus-"Hachiko Bus"
You are here: Home > Shibuya Community Bus-"Hachiko Bus"
Shibuya City provides you with friendly and pleasant community bus services for an easy access to various public facilities such as the City Office, community facilities and railroad stations in the city. 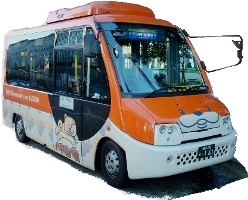 The small-sized and non- step bus also allows wheelchair passengers to board easily. 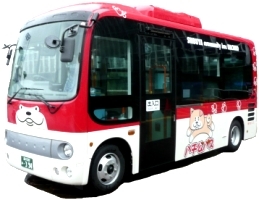 "Hachiko Bus" was named after Shibuya's symbolic and popular dog that has gentle and lovely images to carry passengers safely and reliably. 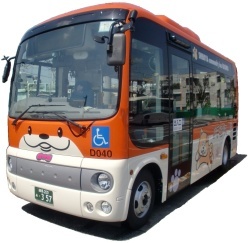 Please make use of the "Hachiko Bus" as your daily transportation. For lost articles, running schedules and bus-stop information, please inquire at each bus company directly. The operation has just started from 1 July (Thu) 2010. The operation has just started from 29 February (Fri) 2008. Bus Route Honmachi-Sasazuka Loop "Haruno Ogawa (A Stream in Springtime) Route "
The operation of this bus just started in September 2004. 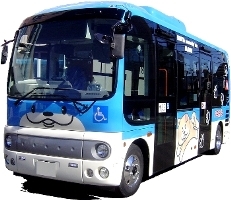 Bus Route Ebisu-Daikanyama Loop "Yuyake Koyake (Sunset) Route"
Cash, exclusive book of tickets, IC cards (Suica ＆ PASMO) are accepted. 2,000yen for 21 single tickets, economical and useful book, are available on the bus.